The Marketing and Public Relations Director leads the marketing as well as the public relations department of an organization. 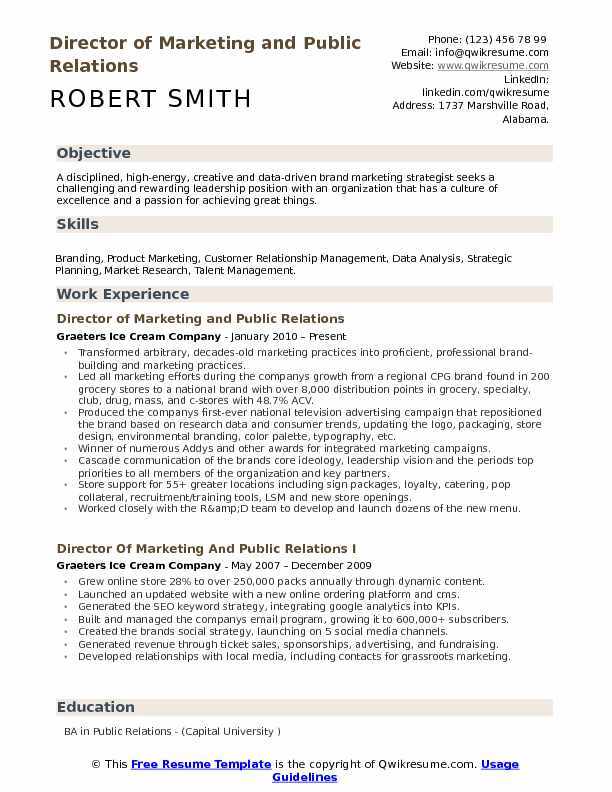 The roles and responsibilities listed in the resume include – developing and executing effective marketing and PR strategies, hiring and supervising marketing and PR staff, assigning activities, reviewing and approving work, overseeing the other departments like communication and sales; communicating regarding budgets, preparing speeches, arranging interviews, assessing marketing strategies and suggesting improvements, ensuring that the advertising campaigns meet the company’s goals, overseeing crisis and resolving issues. 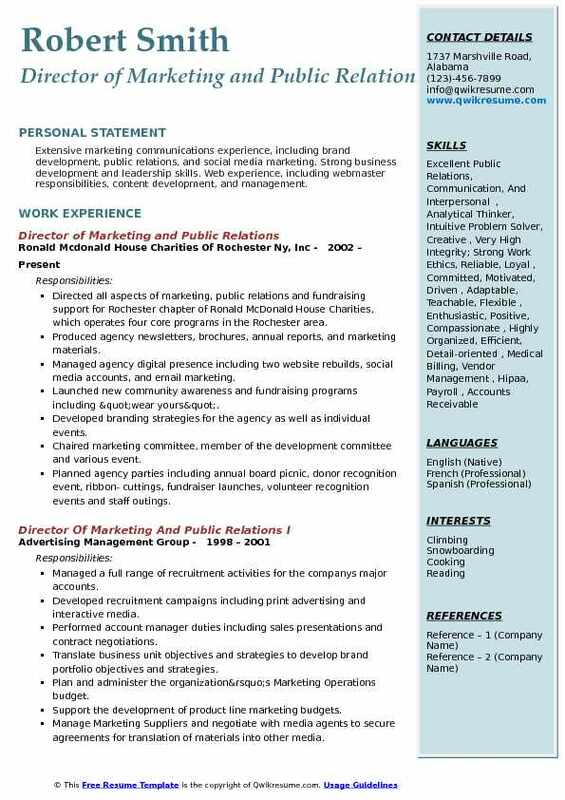 Director of Marketing and Public Relations Resume should highlight qualities such as proven marketing or PR expertise, strong relationship with local and international bodies, a thorough understanding of online marketing techniques and PR methodologies, exceptional writing and editing skills, solid experience over social media accounts, event planning expertise and up-to-date knowledge of current marketing trends. 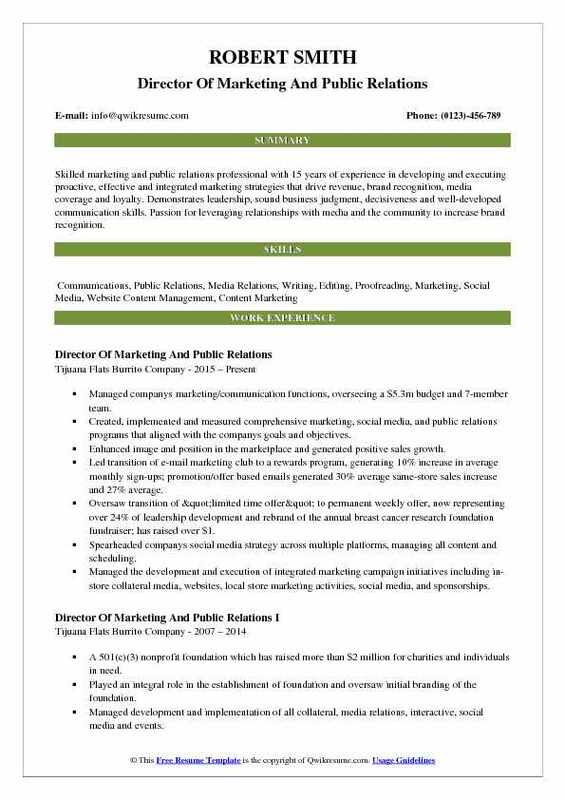 A college degree in the field of marketing, public relations, advertising or communications is common among candidates applying for this role. Summary : A disciplined, high-energy, creative and data-driven brand marketing strategist seeks a challenging and rewarding leadership position with an organization that has a culture of excellence and a passion for achieving great things. Skills : Branding, Product Marketing, Customer Relationship Management, Data Analysis, Strategic Planning, Market Research, Talent Management. Transformed arbitrary, decades-old marketing practices into proficient, professional brand-building and marketing practices. Led all marketing efforts during the company's growth from a regional CPG brand found in 200 grocery stores to a national brand with over 8,000 distribution points in grocery, specialty, club, drug, mass, and c-stores with 48.7% ACV. Produced the company's first-ever national television advertising campaign that repositioned the brand based on research data and consumer trends, updating the logo, packaging, store design, environmental branding, color palette, typography, etc. Winner of numerous Addys and other awards for integrated marketing campaigns. Cascade communication of the brand's core ideology, leadership vision and the period's top priorities to all members of the organization and key partners. Store support for 55+ greater locations including sign packages, loyalty, catering, pop collateral, recruitment/training tools, LSM and new store openings. Worked closely with the R&D team to develop and launch dozens of the new menu. CPG support through shopper marketing, brand ambassadors, demos, events. Summary : I have more than 20 years of award-winning expertise in multimedia marketing strategies that exceed expectations. Through a collaborative team model, I lead the comprehensive communications program for a regional healthcare system serving six counties with a population of 130K including our 3600 employees and volunteers and a $1M budget. Guided a 36-month marketing initiative to move a 378-bed hospital to a different community including logistics, media relations, and internal communications. Implemented a three-year strategic marketing program increasing market share from 75% to 81%, the largest primary market share increase statewide among six similar competitors. Accelerated the redesign of a new 1800-page website, launching in less than two months and increasing both website visits and page views per visit by 30%. Initiated an online patient portal in less than eight months resulting in over 12k active portal users or 57% of patients invited, far surpassing the federal mandate of 5% conversion. Reduced outmigration of specialized services by 28%, generating $50k in revenue by keeping them in-system. Conceived and produced an Emmy-nominated television series, the first of its kind in the marketplace. Spearheaded a change in organizational name, signature and mission including authorship of a 40-page corporate identity manual. 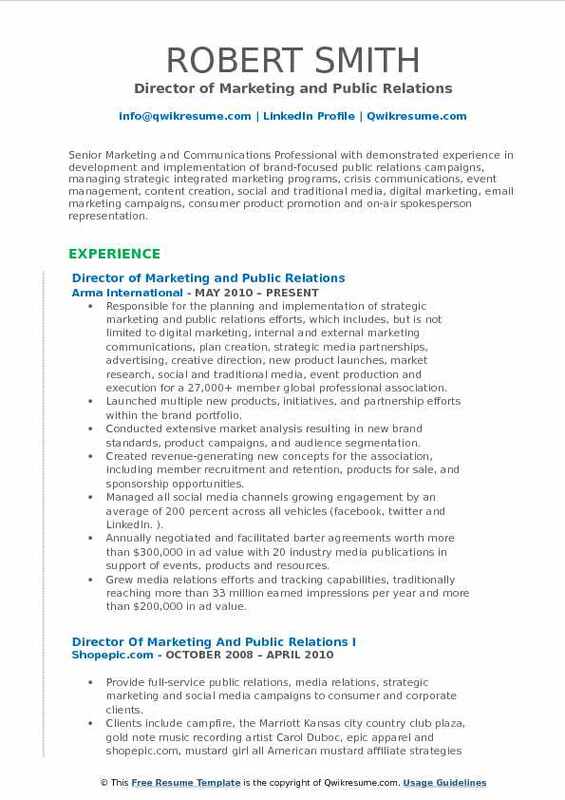 Summary : Skilled marketing and public relations professional with 15 years of experience in developing and executing proactive, effective and integrated marketing strategies that drive revenue, brand recognition, media coverage and loyalty. Demonstrates leadership, sound business judgment, decisiveness and well-developed communication skills. Passion for leveraging relationships with media and the community to increase brand recognition. Managed company's marketing/communication functions, overseeing a $5.3m budget and 7-member team. Created, implemented and measured comprehensive marketing, social media, and public relations programs that aligned with the company's goals and objectives. Enhanced image and position in the marketplace and generated positive sales growth. Led transition of e-mail marketing club to a rewards program, generating 10% increase in average monthly sign-ups; promotion/offer based emails generated 30% average same-store sales increase and 27% average. Oversaw transition of "limited time offer" to permanent weekly offer, now representing over 24% of leadership development and rebrand of the annual breast cancer research foundation fundraiser; has raised over $1. Spearheaded company's social media strategy across multiple platforms, managing all content and scheduling. Managed the development and execution of integrated marketing campaign initiatives including in-store collateral media, websites, local store marketing activities, social media, and sponsorships. Controlled overall brand image across all collateral and messaging platforms, ensuring consistent articulation of the desired image, both internally and externally. Oversaw brand development and grand opening events for Tibby's New Orleans kitchen company. Summary : Senior Marketing and Communications Professional with demonstrated experience in development and implementation of brand-focused public relations campaigns, managing strategic integrated marketing programs, crisis communications, event management, content creation, social and traditional media, digital marketing, email marketing campaigns, consumer product promotion and on-air spokesperson representation. Responsible for the planning and implementation of strategic marketing and public relations efforts, which includes, but is not limited to: digital marketing, internal and external marketing communications, plan creation, strategic media partnerships, advertising, creative direction, new product launches, market research, social and traditional media, event production and execution for a 27,000+ member global professional association. Launched multiple new products, initiatives, and partnership efforts within the brand portfolio. Conducted extensive market analysis resulting in new brand standards, product campaigns, and audience segmentation. Created revenue-generating new concepts for the association, including member recruitment and retention, products for sale, and sponsorship opportunities. Managed all social media channels growing engagement by an average of 200 percent across all vehicles (facebook, twitter and LinkedIn. ). Annually negotiated and facilitated barter agreements worth more than $300,000 in ad value with 20 industry media publications in support of events, products and resources. Grew media relations efforts and tracking capabilities, traditionally reaching more than 33 million earned impressions per year and more than $200,000 in ad value. Increased monthly site traffic, customer acquisition, and product sales using digital marketing strategies, PPC, and SEO. Lead marketing communications and strategy for all aspects of the industry's largest trade show, the Arma international conference expo. 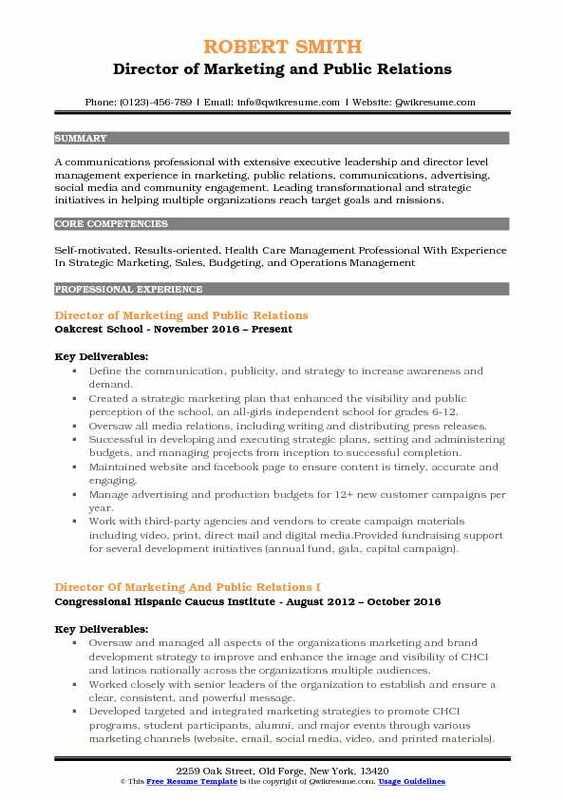 Summary : Extensive marketing communications experience, including brand development, public relations, and social media marketing. Strong business development and leadership skills. Web experience, including webmaster responsibilities, content development, and management. Directed all aspects of marketing, public relations and fundraising support for Rochester chapter of Ronald McDonald House Charities, which operates four core programs in the Rochester area. Produced agency newsletters, brochures, annual reports, and marketing materials. Managed agency digital presence including two website rebuilds, social media accounts, and email marketing. Launched new community awareness and fundraising programs including "wear yours". Developed branding strategies for the agency as well as individual events. Chaired marketing committee, member of the development committee and various event. Planned agency parties including annual board picnic, donor recognition event, ribbon- cuttings, fundraiser launches, volunteer recognition events and staff outings. Negotiated contracts and managed vendors including printers, catering, audio-visual, web design, internet service providers, video production, photography and event service providers. Proficient in word, excel, powerpoint, publisher, InDesign, Photoshop, MailChimp and various other programs. Headline : Accomplished professional communicator with extensive experience in managing marketing and communications programs for a wide array of organizations including non-profit, state government, and higher education. Provides leadership and direction to all aspects of the marketing/business development/public relations. Partners with the hospital CEO to develop and execute business development plans and actions that ensure. Collaborates with internal staff and CEO to develop strategic initiatives that drive new business. Works closely with service line directors to help resolve barriers for adding cases, admissions and/or business. Directs and mentors direct reports and works collaboratively to hire and support the team and holds them. Accountable to develop relationships with key referrers that translate into admissions. Builds relationships with referring physicians, case managers, therapist, administrators and nurses to increase the awareness of services and promote business opportunities. Maintains a database of key referral sources. Arranges c suite meetings with key referral sources and with referring physicians to bridge relationships with internal physicians and clinicians to ensure a quality continuum of care and identify business opportunities. Establishes a calendar of events and marketing campaigns, coordinates and supports special events such as groups, roundtables, etc. 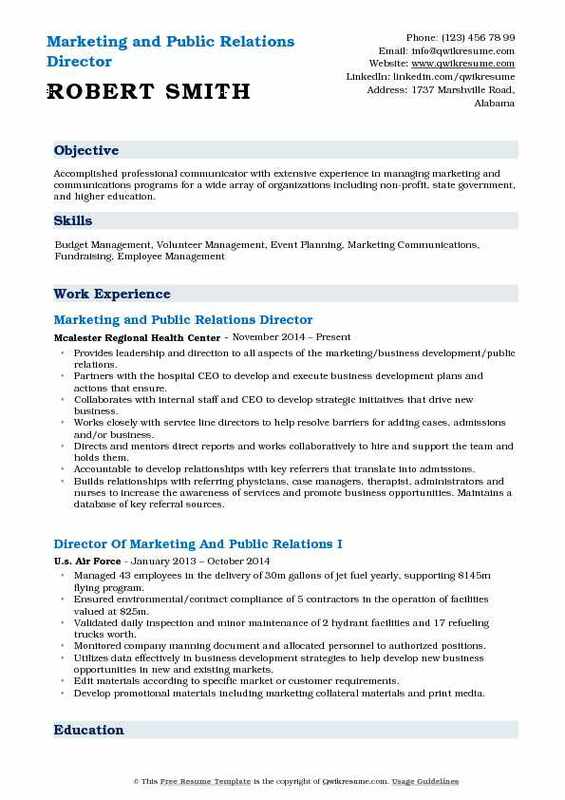 Summary : Seasoned marketing professional with substantial experience in marketing, public relations, strategy, sales, media relations, recruitment and project management. Proven experience developing and executing successful integrated marketing and public relations campaigns. Ability to thrive in a fast-paced, results-oriented, collaborative environment, while coordinating multiple projects and managing deadlines. Plan, develop, and implement public relations and marketing strategies leveraging social media, local print and online publications, community groups, schools, and business alliances. Responsible for public relations, media relations, community relations, social media, events ranging in size from a few hundred to several thousand attendees, writing and design of all collateral including print and digital, multiple website management, e-blast newsletters, public programs and outreach, educational outreach, and television/radio interviews. Develop, manage, and design multiple websites, and create various interactive forms including donation forms and surveys. Manage all social media including Facebook, Twitter, Instagram, Youtube, Google AdWords. Event and program development driving event projects of all sizes up to several thousand attendees from initiation through completion. Create weekly e-newsletter including all articles, graphics, and design. Boosted bi-weekly email distribution list from 6k to 10k+ subscribers in 18 months. Media relations across all platforms including press release copy writing, tv-radio appearances, writing regular feature articles. Educational and community outreach including presentations, on-site tours, building strategic alliances. Create all collateral and graphics including print and digital, and work closely with professional printers. Grew programs and members through events including free public pet grief support group, pet memorial ceremony, dogfest, black tie tails gala, valentines day pet wedding, pets for patriots, read to the animals, free adoption for first responders. 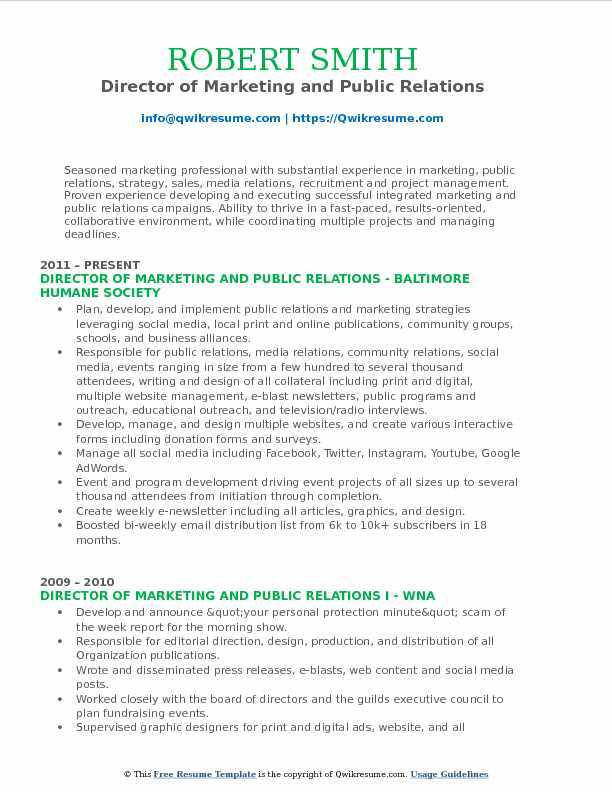 Simultaneously ran volunteer program for over a year while also Director of Marketing PR. 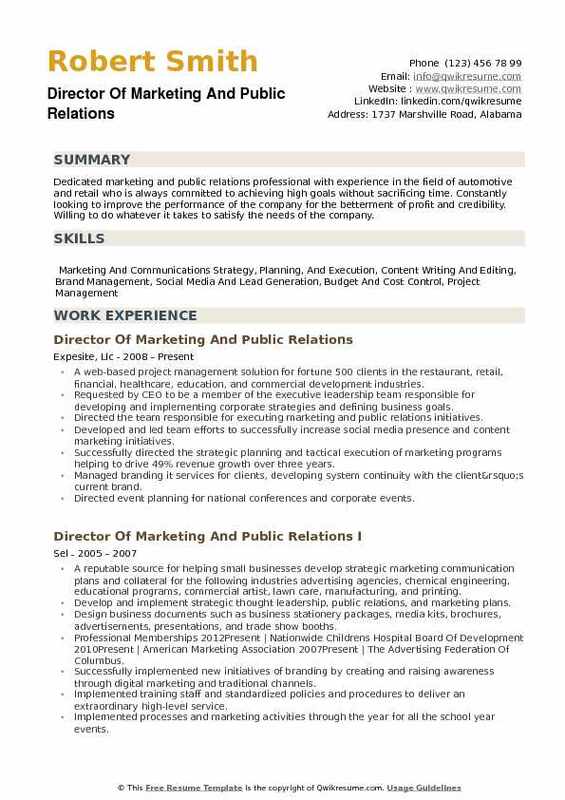 Headline : A communications professional with extensive executive leadership and director level management experience in marketing, public relations, communications, advertising, social media and community engagement. Leading transformational and strategic initiatives in helping multiple organizations reach target goals and missions. Define the communication, publicity, and strategy to increase awareness and demand. Created a strategic marketing plan that enhanced the visibility and public perception of the school, an all-girls independent school for grades 6-12. Oversaw all media relations, including writing and distributing press releases. Successful in developing and executing strategic plans, setting and administering budgets, and managing projects from inception to successful completion. Maintained website and facebook page to ensure content is timely, accurate and engaging. Manage advertising and production budgets for 12+ new customer campaigns per year. Work with third-party agencies and vendors to create campaign materials including video, print, direct mail and digital media. Provided fundraising support for several development initiatives (annual fund, gala, capital campaign). Positively impacted enrollment, retention, and fundraising support for the school. Headline : Communications professional with extensive social media marketing experience and creative, detail-oriented writing skills. Strong ability to work within teams and multi-task projects under strict deadlines. Marketing and product development experience, enabling start-up and established companies to increase leads and revenue. 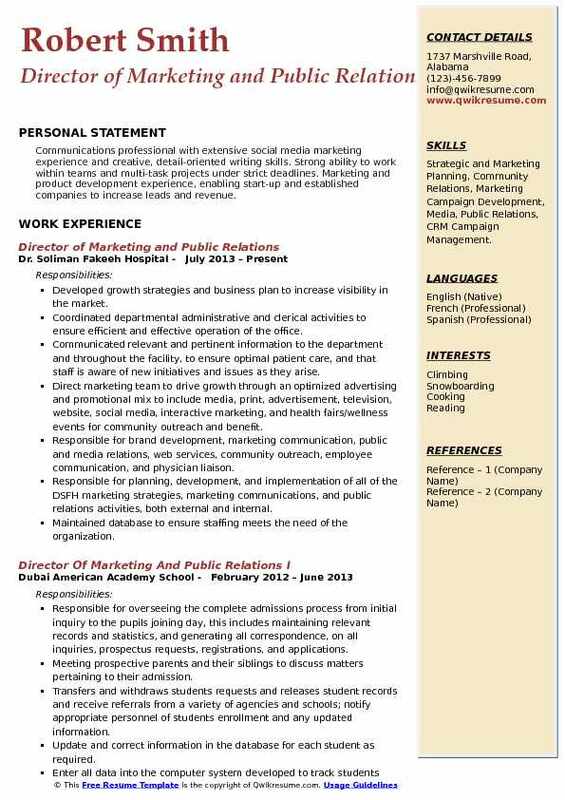 Skills : Strategic and Marketing Planning, Community Relations, Marketing Campaign Development, Media, Public Relations, CRM Campaign Management. Developed growth strategies and business plan to increase visibility in the market. Coordinated departmental administrative and clerical activities to ensure efficient and effective operation of the office. Communicated relevant and pertinent information to the department and throughout the facility, to ensure optimal patient care, and that staff is aware of new initiatives and issues as they arise. Direct marketing team to drive growth through an optimized advertising and promotional mix to include media, print, advertisement, television, website, social media, interactive marketing, and health fairs/wellness events for community outreach and benefit. 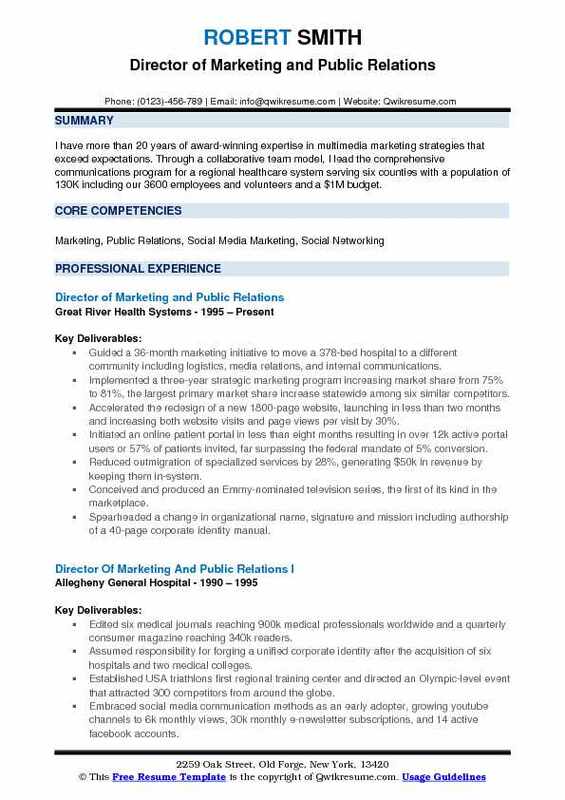 Responsible for brand development, marketing communication, public and media relations, web services, community outreach, employee communication, and physician liaison. Responsible for planning, development, and implementation of all of the DSFH marketing strategies, marketing communications, and public relations activities, both external and internal. Maintained database to ensure staffing meets the need of the organization. Reviewed, audited and approved all of the department budgets, billing, and collection. Served as a liaison between physicians; nurses, pharmacy, and upper management. Summary : Dedicated marketing and public relations professional with experience in the field of automotive and retail who is always committed to achieving high goals without sacrificing time. Constantly looking to improve the performance of the company for the betterment of profit and credibility. Willing to do whatever it takes to satisfy the needs of the company. A web-based project management solution for fortune 500 clients in the restaurant, retail, financial, healthcare, education, and commercial development industries. Requested by CEO to be a member of the executive leadership team responsible for developing and implementing corporate strategies and defining business goals. Directed the team responsible for executing marketing and public relations initiatives. Developed and led team efforts to successfully increase social media presence and content marketing initiatives. Successfully directed the strategic planning and tactical execution of marketing programs helping to drive 49% revenue growth over three years. Managed branding it services for clients, developing system continuity with the client’s current brand. Directed event planning for national conferences and corporate events. Recruiting attendees and sponsors increasing sponsorships and attendees for corporate events. Managing internal staff and event agendas, presentations, and meetings.